I make a lot of granola. It’s maybe becoming a problem. 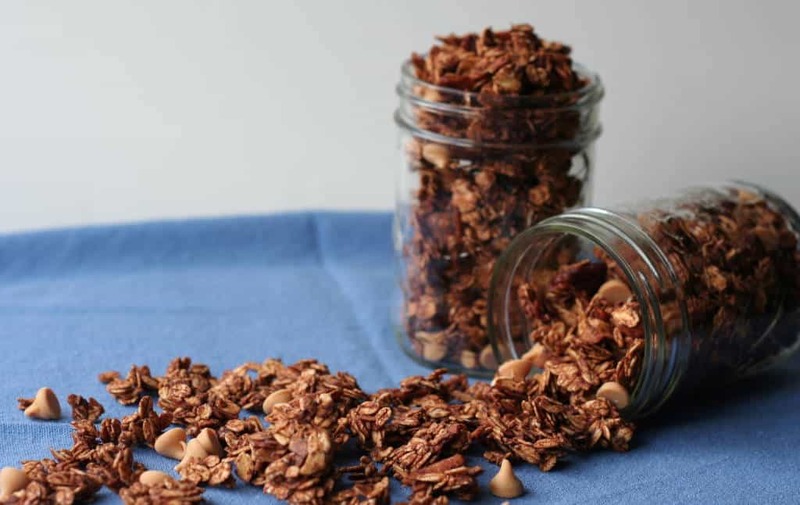 There are now 4 granola recipes on this little blog, and it’s only 4 months old. Does that mean that in a year there may be 12 recipes for granola here? I won’t lie, it’s possible. And I’m not even sorry. All of them were just too good not to share. I will say though, that this chocolate peanut butter banana granola is the only one that I was grabbing bits of every time I walked by. Generally I’ll have it with my yogurt in the morning and I’m good. But this? Could not stop eating it. 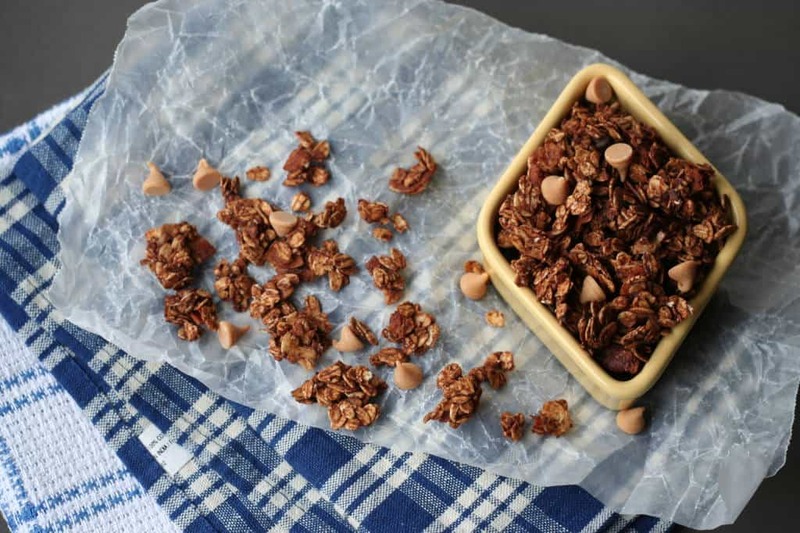 It’s definitely a snack-able granola recipe. I made this with both peanut butter chips and semi sweet chocolate chips, and I preferred the peanut butter version so that’s how I wrote it up, but if peanut butter isn’t your thing then swap in chocolate chips. The other wonderful thing about this granola, besides its taste? How healthy it is! This makes about 6 cups of granola and there’s only 3 tablespoons of oil and just under 1/2 a cup of sugar, half of which is maple syrup. And it’s still super crunchy, and sweet enough, at least for me. It isn’t an overly sweet granola though, so if you like your granola sweet you might want to increase the maple syrup by a tablespoon or two. We all loved this version. What’s your favourite granola? I obviously need more variations! Note: I used pecans and coconut chips, but feel free to substitute whatever nuts you like, and plain coconut if you don’t have the chips. I’ve also made it with both canola oil and coconut oil and both are good so use whichever you prefer. Preheat the oven to 250 degrees F. Combine the brown sugar, oats, coconut chips, pecans and cocoa powder in a large bowl. In another bowl or measuring cup, combine the banana, oil, maple syrup, and salt. Pour the liquid into the oat mixture while stirring to combine. Mix until the liquid is evenly distributed. Remove from the oven and allow to cool completely. Stir in the peanut butter chips. Transfer to a large airtight container. It will keep in an airtight container at room temperature for 7-10 days. Homemade granola is the best! I go through phases where I make it like crazy! And peanut butter and chocolate is just the best ever. I know, it's just so good, I can't stop! This is actually the first one with peanut butter I've liked though, and it was only peanut butter chips for the flavour! I haven't yet managed a variation with actual peanut butter than I've loved. I guess that'll be next up on the list of variations to try! Thanks for visiting Ashley! anything with peanut butter gets a thumbs up from me and this granola looks delicious! don't blame you for making it all the time, homemade granola is REALLY awesome! Thanks Manali! Homemade granola really is so much better than the stuff at the store hey? And so many options! I'm kind of addicted to granola, so I know how you feel! I love testing out new ways to make it, so much fun! This chocolate peanut butter kind sounds fantastic! I love that you added in bananas, too. Delish! I keep ending up with new favourites, it's a little ridiculous really! There's just so many combinations to try, I can't stop! :) Thanks for the comment! Thanks Michele! At least I'm not the only one out there making it incessantly! It IS just the perfect snack or breakfast though!